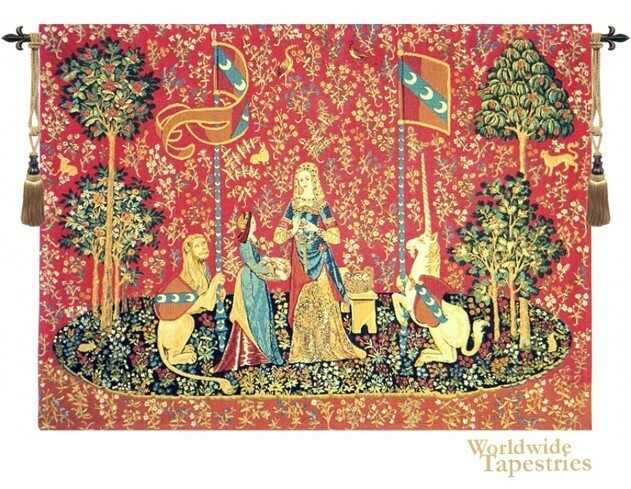 This tapestry "Smell (L' Odorat) I" shows a scene portraying the sense of smell from the series of tapestries "Lady and the Unicorn". The lady's maid servant is seen here holding a plate of flowers from which the lady takes one to smell. The lion and the unicorn are flanking the scene and protecting the lady and her maiden. The originals were discovered in 1841 in the Boussac castle in France after centuries of neglect and were reconditioned. This unicorn tapestry "Smell (L' Odorat) I" is backed with lining and tunnel for easy hanging. Note: tapestry rod and tassels, where pictured, are purchased separately.